The average music savvy already knows that a great deal of the most interesting electronic music is coming out of latin american countries. With Mexico and Argentina at he first wave of experimentalists, we now have to include Colombia, because of artists like David Velez, aka Lezrod. David started his jouney of micro-ambient electronica right here at Zymogen, with 'Retorno a la Nada', a mutant body of glitchy drones and jazz-inspired compositions. But Lezrod's music isn't static, it's always evolving and shapeshifting into something that completely mirrors the artist's complex personality. David is also a big music lover, of all kinds. So it's not surprising that eventually he would ask some of his friends, also music artists that David respects, to do something together. 'Data Transfer' is the result of a combined work led out by Lezrod and his friends, where chunks of music information were transfered electronically back and forth, between Lezrod's hometown Bogota and other distant places like Darren McClure's Japanese home, Gurdonark's Texas prairie, Stephen's Ohio and Fgmcvp's Florida beaches, the latter being a personal friend of David from Colombia. All music pieces were assembled by Lezrod and this party of artists that he admires. Darren McClure, one of David's recent musical discoveries, was responsible for the work on four out of the seven tracks that make this album. 'Data Transfer' is also Lezrod's most 'low profile' work to date. Maybe the fact that these weren't meant to be solo tracks, made him hide a bit from his sometimes brutal approaches to composition. Darren's collaboration is a perfect example of that. His microtonal walls of sound, completely dampen Lezrod's glitches, without making them disappear, taming them, taking control of the narrative. 'North Coast' and 'Masato' are personal favorites and possibly the best work these two artists had made until this day. Two delicate soundworks, built up from huge microstructures with complex rhythms of bleeps and glitches, bonding together into heavy and hazy waves of drones. I could listen to this all day and just leave my brain idling. Stephen Walter and Gurdonark pieces are pretty different from McClure's ones. Walter's 'Ramute' is a short piece of drum'n'bass-like fuzzy beats with melodic and hypnotic tones glued on top. Gurdonark's 'Final Dub' has a chamber kind of ambience feel, with lots of noisy layers piled up and heavily delayed, Kingston flavored. 'Opitas', Lezrod's tribute to his colombian mate and old college friend Fgmcvp, is perhaps the most Lezrod-kind of track. It reminds me of other tracks he has made, namely the ones from 'Retorno a la Nada'. Not surprinsingly, because Fgmcvp is credited as David's mentor when it comes to music production. David has compiled here a great selection of collaborative work that will be remembered and tresured for years to come. There aren't many artists with such relatively short careers making music with this quality and density. Zymogen can indeed be proud of putting out releases like this. And from this side, we can only be thankful for that. Back in April the Italian Zymogen netlabel released the seven track epos Data Transfer, on which the Colombian artist Lezrod teamed up together with Darren McClure, Fgmcvp, Stephen Walter and Gurdonark in order to create a versatile patchwork of experimental tunes. Jas: In the beginning the track reminds me of Takeshi Nakamura's Dozed Off (the horror movie like echo sequences), but then it evolves into shy harmonics trying to defeat the dark graveyard mood. Opitas: Peaceful 9th chords and clicks and pops conflict rhythms like raindrops dripping from a roof top. A drizzle day in the city with reflections of streetlight in puddles. Remix1norm: Edgy ringmodulations gradually shifting to a melodic sequence which causes confusion by slightly alterring its metrics before it slowly fades out. North Coast: Darren McClure's musical language is the dominating part here, with a characteristic combination of low frequency tones and almost inaudible beeping. A clicks and pops rhythm layer fades in and is followed by some sparse chords. Masato: Another cloudy night on the graveyard, bells drowning in echos combined with ear-grinding overtones creating a subtile tension. Final Dub: Eventually some predictable harmonics resolve the tension without falling apart again or being splintered by metrics shifts, albeit still surrounded by a noisy background, we‚Äôre released with a smile. 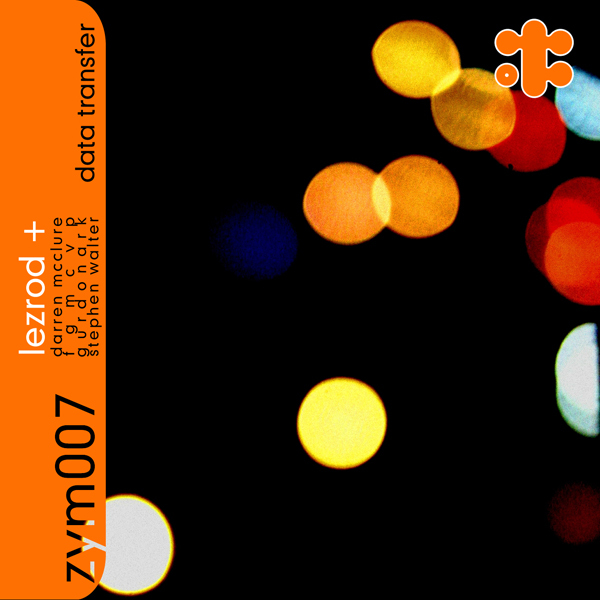 Lezrod's Data Transfer experiment yielded impressing results: Occasional reminiscences of Minimalist Music suggest Lezrod being interested in wide ranges of music (aside from contemporary Electronica) and its diversity of moods makes "Data Transfer" one of the strongest releases of 2006 so far. Data transfer is the result of the collaboration of Lezrod and a bunch of his musician friends. This collaboration has led to an incredible ambient canvas built with diluted and distant drones superposed on sweet layers of light noise. The whole sounds like a kind of chillout or meditation soundtrack for a noise fan however. The soundscapes are from time to time adorned with fairly high pitched glitch melodies which emphasize the zen sentiment I talked about before. The album finishes on a little faster pace with Ramute and Final Dub. Enjoy. Ambient/Glitch/Soundscapes/Experimental/Drone. Un album/projet très intéressant. Les constructions sont subtiles, le son est soigné, et de chaque morceau se dégage une même impression de progression lente et organique, accidentée mais irrésistible. schon seit einiger zeit liegt lezrod's neues release auf zymogen bei mir auf der festplatte. im zuge der vorbereitungen auf die kommende kreislauf.fm netaudiosendung über zymogen hat mir filippo dieses release schon mal rüber geschaufelt. lezrod hat einige seiner freunde versammelt um mit ihnen gemeinsam auf eine reise zur klangforschung zu gehen. dabei herrausgekommen ist ein fulminantes abenteuer. data transfer ist ein konzeptalbum, geeignet für fast alle lebenslagen und begleitet uns auf so manche reise ins ich. wunderbar was hier gezaubert wurde! Data Transfer is a fascinating musical project. It's great to hear how all input has been carefully molded into one organically sounding/feeling whole. I think tracks 3, 6 and 7 are my favorites but that's very personal of course. Fabian Moncadas (fgmcvp) presence in this project is very welcome and it's great to see how the tutor and his pupil slowly part eachother musically to head for their own directions. Lovely and strong net album. Thanks! Lezrod, artista colombiano das electrónicas que dá pelo nome civil de David Velez, regressa com um terceiro disco, depois de "Retorno a La Nada", na Zymogen, e do mais recente "Seleccion Natural", na Test Tube. De volta à Zymogen, desta vez com "Data Transfer" (zym007), Lezrod partilha o cenário com os artistas com quem o audio destructionalist trocou ficheiros musicais durante algum tempo (daí o título "Data Transfer"), Fabian Moncada, aka fgmcvp (Colômbia), Darren McClure (Japão), Bob Gurdonark (Texas) e Stephen Walter (Ohio). O que nos oferecem Lezrod e amigos desta vez é um novo conjunto de composições mutantes na forma e conteúdo, complexas estruturas ritmicas e texturais baseadas em drones e glitch experimental, inusitadas construções electrónicas organizadas e montadas segundo as leis do cinema, imagens e sons em movimento. Notam-se as diferenças de concepção dos vários artistas, que resultam em sinergias positivas a favor da criação musical. A tónica da produção é posta na colaboração artística e o resultado é muito interessante de ouvir. Repetidamente. Notable cooperaci? ?n de talentos, en un album en el que se mezclan densos drones y microsonidos de forma muy coherente y ordenada. Una produci? ?n c?°lida, con "sabor" a valula y llena de peque?±os matices. Un paso adelante sin duda en el trabajo de estos artistas, que aunque ya nos tienen acostumbrados a grandes releases con sus proyectos personales, esta mezcla se revela francamente interesante a la escucha. First is the summary of the previous episodes. If you have unfortunately miss the first Zymogen contribution of Lezrod "retorno a la nada", i have the regret to inform you simply have passed through one of the best release of 2005 (but it is not too late to check it). Then, here it is "Data Transfer", a netaudio release which opens, for the first time in the short history of the label, a second collaboration with an artist. You probably imagine a possible comparaison with the previous release, it will be a wrong way as Lezrod have chosen the delicate exercice of plural collaborations. Mainly with the homing device Darren McClure, Fgmcvp for whom David Velez (Lezrod) have done remixes, Stephen Walter or electronica artist Gurdonark, this "Data transfer" is very well entitled as the tracks seem so easily "transferable" for the artists working on, a real successful collaboration from the man of Bogotà with his guests, as a sort of enriching friendship. Then, of course, it is finally possible to have a special interest for one or another track ("jas" which opens the album, is perhaps the most emblematic), but we never feel this sort of step on interest we usually have in those productions. Lezrod have called them "data"...or was it a "harmonic data" transfer ?